Designed and engineered in Norway, Gaudi’s neat contemporary form and ergonomically contoured cushioning is upholstered in luxurious top grain leather and enhanced by its Scandi inspired wood detail and iconic polished steel star base to ensure a real style statement in even the most discerning of modern living spaces. 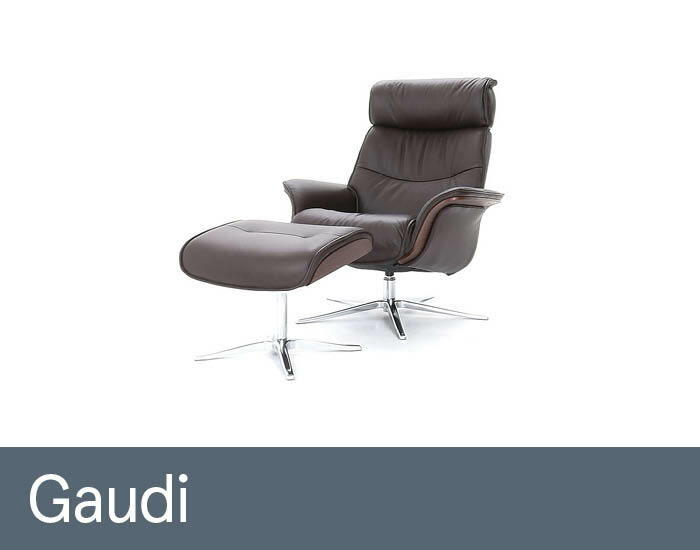 Whether it’s to read, watch TV or snooze in, you can sit upright, semi or fully reclined using Gaudi’s tension-adjusted easy lean-back mechanism. Hand crafted from the finest materials, you can rest assured with a 10 year frame and interior warranty plus 5 year mechanism warranty. This top-quality swivel recliner chair also includes a free angled footstool to ensure complete relaxation.